We are all aware of the dangers lurking in the cyberspace domain. Several types of malware are launched, almost on a daily basis to target users over the web. Similarly, many countermeasures have been adopted to combat this growing threat. It is imperative that everyone should be equipped on how to face it. The first step in all this is staying ahead of the curve by becoming aware. According to statistics, the average cost of fighting cyber-crime has gone up to $ 100 billion all over the world. This is enough to understand the gravity of these online attacks. 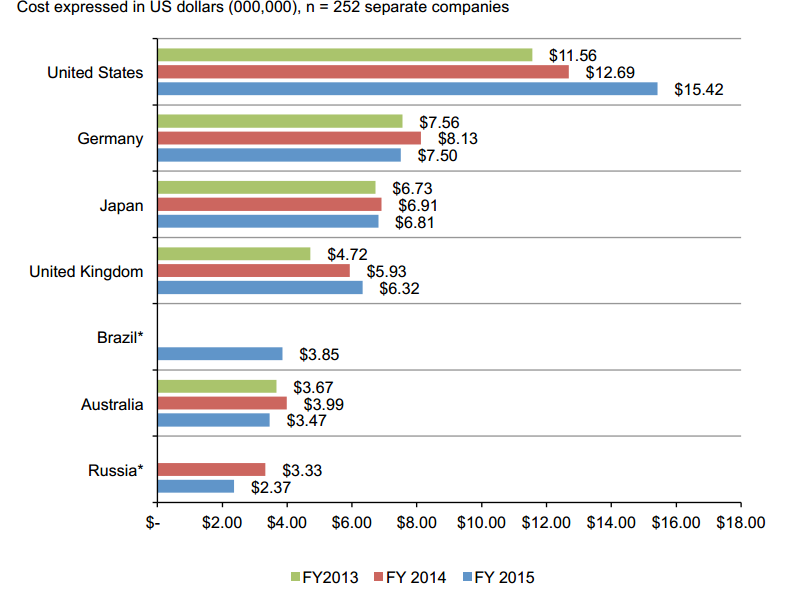 Statistics showing cost incurred in combating cyber threats from 2013-15. Without further ado, let us see what damage cyber attacks can cause and how you can protect yourself against it. 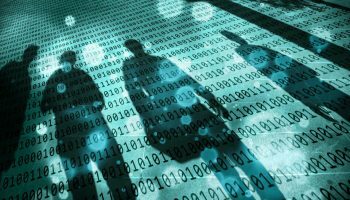 You’d be surprised to learn that there is a separate list of FBI’s most wanted criminals in the cyber-crime domain. Amidst them is the group by the name of JABBERZEUS. They are known for installation of the Zeus malware. 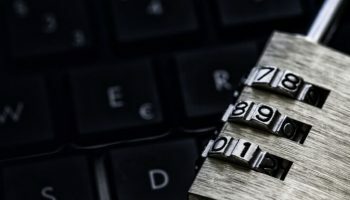 The malicious software which is installed as a result gains access to your bank account numbers, passwords, and other confidential information. It’s variant in the form of GameOver Zeus too wreaked havoc and brought financial losses to a staggering $ 100 million. Therefore, in order to stay protected, keep yourself updated with the latest happenings in the cybersecurity space. Meanwhile, also update your security software as well as take necessary action by using a good VPN to encrypt your private data. Yes, the viruses which are developed are quite expensive. Imagine what lengths these cybercriminals go to destroy and destruct. Not only your computer, heck, your life! An example of such a virus is MyDoom. This was the most expensive virus built in the history of viruses. According to one study, it has cost an estimated damage of $ 38.5 billion, alone. How was the virus transmitted to cause such a humongous loss? Well, it was spread through email and was disguised as junk mail. It is also known as the fastest email worm to have ever spread! Now you may not get affected by MyDoom directly but are always vulnerable to viruses of this intensity. Once you become a victim of this virus, it is anyone’s guess that you will ever get hands back on your data or your device, for that matter. A regular antivirus protection may not be very effective in this case as viruses of such type use morphs. Thus, become practically undetectable. Alongside your antivirus, a proactive solution is needed to guard yourself against a threat of this magnitude while online. Here, Ivacy VPN will scan your internet traffic by encrypting it, preventing any data leaks, in addition to blocking hacker access. Did you know computers are vulnerable to exploit kits? Exploit kits are software vulnerabilities. And it occurs 99% of the time. These can be critical as it allows for hackers and cybercriminals to access your information. The cure lies in safeguarding your web browsers as well as by keeping up with essential security updates. The current user base of social media is 2.46 billion and counting. This means, people spend countless hours on social and that is when the attack happens. Eyeing the social media activities of online users is a favorite pastime of these cybercriminals. Social media users are very fond of clicking links they find posted by their friends and family. But what happens; attacks such as “like-jacking”, “link-jacking”, and phishing activities occur. Like-jacking is when cybercriminals post fake Facebook “like” buttons to different web pages. When a user clicks on it, they, in turn, download malware. Link-jacking, as the name implies, is used to redirect one website link to another website. meaning, a trusted website’s link is redirected to the malware-infested website. The user unknowingly lands on an infected site and well, the rest is history. 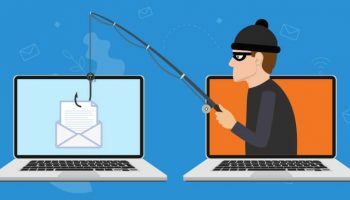 In phishing, breach of privacy occurs and criminals gain access to your sensitive information. Since people trust their friends online, “make-believe” is very common. 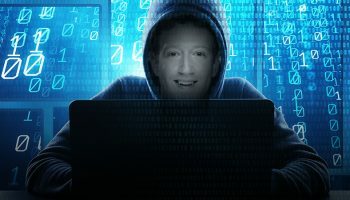 It allows criminals to fake identities and according to one report, 600,000 Facebook accounts get compromised with each passing day. What can you do to stay protected? 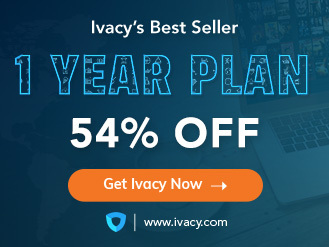 Do not be too quick to click any unverified links, educate yourself on the dos and don’ts of social media, and install a system in place which offers protection from malicious websites such as via Ivacy’s secure download feature. Inside job means damage to your corporate infrastructure by disgruntled former employees. It happens when an employee holds a grudge and quits or is unjustly fired. They resort to such underhanded tactics because they cannot undo what happened to them. They can be categorized. There are “malicious insiders” who will cause damage due to the rights access they had when they were part of the organization. Then there are “exploited insiders” who will be lured in by other parties to give passwords and share other confidential information. Then there are those who are careless and will either lose access to sensitive information or will accidentally delete it. No matter how unfortunate but will still qualify as an inside job. The preventive steps include staying mindful of your passwords and other essential data. Proper backups should be in place and especially if an employee is soon to become an ex-employee, it is always a good practice to start distancing him from work-related matters and company meetings so he has less access to information. In the case, he or she intends to do some damage to the company they won’t be able to. Always remember, that threats tend to change from time to time. You cannot rely or rest on any single form of protection. You need to keep upgrading yourself in order to combat the cyber threats. It is an ongoing fight and no matter how much damage it aims to bring, we have to be prepared. Mix and match. See which combination best suits you.